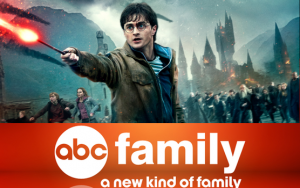 If you’ve always wanted to go to Hogwarts School for Witchcraft and Wizardry but was never admitted because you’re a Muggle, ABC Family has the next best thing. The network invites its viewers to revisit the magical series with a whole week dedicated to The Chosen One and his adventures. So find your wand and Marauder’s Map, invite your mates over for some Butterbeer, and watch the battle between good and evil unfold when Harry casts his magic, starting Monday, October 13th and concluding with Funday on Saturday, October 18th. Based on J.K. Rowling’s popular novels about the boy who lived, “Harry Potter and the Sorcerer’s Stone” introduces fans to Harry Potter (Daniel Radcliffe), who learns on his 11th birthday that he is the orphaned son of two powerful wizards and possesses unique magical powers of his own. Invited to attend Hogwarts School of Witchcraft and Wizardry, Harry embarks on the adventure of a lifetime. At Hogwarts, he finds the home and the family he has never had. After a long summer with the horrid Dursleys, Harry Potter is thwarted in his attempts to board the train to Hogwarts School of Witchcraft and Wizardry to begin his second year. Harry’s only transportation option is a magical flying car, but unfortunately it crashes into a valuable (and clearly vexed) Whomping Willow. Still, all this seems like a day in the park compared to what awaits Harry that fall within the haunted halls of Hogwarts. Chilling, malevolent voices whisper from the walls only to Harry and it seems certain that his classmate Draco Malfoy (Tom Felton) is out to get him. Soon it’s not just Harry who is worried about survival, as dreadful things begin to happen at the school. The mysteriously gleaming foot-high words on the wall proclaim: “The Chamber of Secrets Has Been Opened. Enemies of the Heir, Beware.” But what exactly does it all mean? Harry, Hermione (Emma Watson) and Ron (Rupert Grint) risk their own lives to solve this 50-year-old, potentially deadly mystery. Harry, Ron and Hermione return for a third term at Hogwarts School of Witchcraft and Wizardry. But Harry’s fate looks bleak when the infamous Sirius Black (Gary Oldman), who was convicted of killing 13 people with a single curse, escapes from prison. The only clue to where Sirius is headed: The Azkaban guards heard Black muttering in his sleep “He’s at Hogwarts … He’s at Hogwarts.” Even within the walls of his magical school, Harry may not be safe from a convicted killer. A summer has passed since Harry’s encounter with the Dark Lord (Ralph Fiennes), and Harry returns to learn that the wizarding community remains in denial about Voldemort’s return. The minister of magic believes that Headmaster Dumbledore (Michael Gambon) is lying and assigns a member of his staff, Dolores Umbridge (Imelda Staunton), to be the new Defense Against the Dark Arts teacher. When her Ministry-approved course leaves the young wizards woefully unprepared to protect themselves against the dark forces threatening them, Hermione and Ron urge Harry to take charge. Meeting secretly with a small group of students who name themselves “Dumbledore’s Army,” Harry teaches them how to defend themselves against the Dark Arts and prepares the courageous young wizards for the extraordinary battle that lies ahead. Harry returns to Hogwarts for his sixth year and faces a growing danger that may be more than a match for his strengthening powers as a wizard. While Death Eaters emboldened by the return of Lord Voldemort wreak havoc in both the Muggle and Wizarding worlds, Harry suspects new dangers lie within Hogwarts. Dumbledore, racing to prepare Harry for a battle that he knows is fast approaching, brings him on a perilous mission to find the key to unlock Voldemort’s defenses. Meanwhile, the students face a different adversary as teenage hormones rage: Harry’s friendship with Ginny Weasley (Bonnie Wright) grows into something deeper; Lavender Brown (Jessie Cave) lavishes her affections on Ron while Hermione simmers with jealousy; and a box of love potion-laced chocolates ends up in the wrong hands. In the first part of the seventh and final adventure, Harry, Ron and Hermione set out on their perilous mission to track down and destroy the secret to Voldemort’s immortality and destruction — the Horcruxes. On their own, without the guidance of their professors or the protection of Dumbledore, the three friends must now rely on one another more than ever. But there are Dark Forces in their midst that threaten to tear them apart. Meanwhile, the wizarding world has become a dangerous place for all enemies of the Dark Lord. The long-feared war has begun and Voldemort’s Death Eaters seize control of the Ministry of Magic and even Hogwarts, terrorizing and arresting anyone who might oppose them. But the one prize they still seek is the one most valuable to Voldemort: Harry Potter. The Chosen One has become the hunted one as the Death Eaters search for Harry with orders to bring him to Voldemort…alive. Harry’s only hope is to find the Horcruxes before Voldemort finds him. But as he searches for clues, he uncovers an old and almost forgotten tale — the legend of the Deathly Hallows. And if the legend turns out to be true, it could give Voldemort the ultimate power he seeks. Little does Harry know that his future has already been decided by his past when, on that fateful day, he became “the Boy Who Lived.” No longer just a boy, Harry Potter is drawing ever closer to the task for which he has been preparing since the day he first stepped into Hogwarts: the ultimate battle with Voldemort. The motion picture event of the generation comes to a close in the second part of the final chapter in the monumental Harry Potter series. The boy wizard’s adventure concludes with the climactic final battle between “The Boy Who Lived” and Lord Voldemort. Making their final stand upon the ramparts of Hogwarts School of Witchcraft and Wizardry, Harry, Ron and Hermione face their greatest foe and make the ultimate sacrifice.